In the last two books I’ve read by André Alexis, there have been sheep and there have been dogs. The Hidden Keys has very few animals, but is still filled with interesting characters; a thief, an addict, a drug-dealer, a thug, an artist who stuffs deceased pets for a living, and a few billionaires. What do all these characters have in common? They are all involved, in some way, in a treasure hunt; either in pursuit of the treasure, or in pursuit of the people who are in pursuit of the treasure. It all started when Willow Azarian (the aging heroin addict) went up to Tancred (the thief), and told him the story of her family’s billions, her father’s death, the money he left them all, and most importantly the mementos he left each of the five Azarian siblings. Willow believes they hold clues to a further treasure/discovery. She’s not interested in the treasure as much as she is interested in finding out if she is right, or if there is a further message from her father who she was close to. She wants Tancred to steal each of the mementos from her siblings, and help her figure out the mystery. Now, Tancred may be a thief, but he’s a nice person. He gives Willow his word that he will help her, starting a chain reaction of antics involving many characters; the drug-dealer and his thug who want in on the action, the artist who made the original mementos and has always suspected they held more meaning, the five Azarian siblings who have their own opinions about their father and his mementos, Tancred’s friend Olivier who helps him steal on occasion, Tancred’s friend Daniel who is a detective on the case and wishes he were not, and the man in the graveyard hired by more than one of them to keep watch over a mysterious mausoleum. The puzzle/mystery/treasure hunt at the heart of the story. Following along while they pieced together the clues and went searching for the treasure was a lot of fun. The big question being: is there even going to be a treasure at the end of it all, and if so, what will it be? The characters were all different and unique. We get a bit of backstory on each one to explain how he/she got to where they are today. None of them are good or bad, but a combination of both. I found the friendship between Tancred and his friends touching. Having been friends for life, and knowing each other so well, they are accepting of each other and how they live their lives. Alexis is not afraid to make his characters look ridiculous. A couple of Tancred and Olivier’s heists turn into slapstick comedy scenes. And Colby makes a fool of himself trying to insert himself into a higher position of power. Stealing an old man’s leg to break into a building is beyond absurd. But they pull it off. For fans of Fifteen Dogs, Majnoun and his owners make an appearance at a dinner party. Inspired by a reading of Robert Louis Stevenson’s Treasure Island, The Hidden Keys questions what it means to be faithful and what it means to be good. This theme plays out the most through Tancred’s character; to help Willow and faithfully keep his word to her, he has to lie to people he knows and steal from people he doesn’t want to steal from. For the first time in his career, he feels conflicted about what he does for a living. At a certain point, he no longer has an interest in the outcome; he is merely continuing because he gave his word to Willow. His friend Daniel (the Detective) also has some soul-searching to do when he begins to suspect who is behind the rash of Azarian robberies. But you have to remember there is a difference between doing good and thinking you’re doing good. Almost everyone thinks they’re doing good. But we know too little, Tancred. I mean humans know too little. When a man has so little idea what the consequences of an action will be, how can he know if he’s doing good or not? I’m convinced it takes a certain amount of faith to do good, Tancred. Not faith in God. I mean, faith that the actions you take will have the outcomes you desire. I don’t know why people don’t worship chance. It’s as powerful as any of the gods and it doesn’t need money, doesn’t punish, doesn’t care what you eat on Friday. I’m not a believer, but if I was going to be, I’d worship chance. You could have churches that look like dice. The only reservation I have about wholeheartedly praising this book is the ending. After the lead-up to the end, I felt ever-so-slightly dissatisfied. On the other hand, I don’t know how else he might have ended it. In any case, the journey this book takes you on is well worth the possibility of a small disappointment at the end; one that is entirely subjective. One thing I have learned after reading three books by André Alexis: I find his writing soothing; like I know I am firmly in the hands of a good storyteller. He’s also good at making me think. Can’t wait for his next one! Thank you to the folks at Coach House Books for sending me a copy of this book for review! 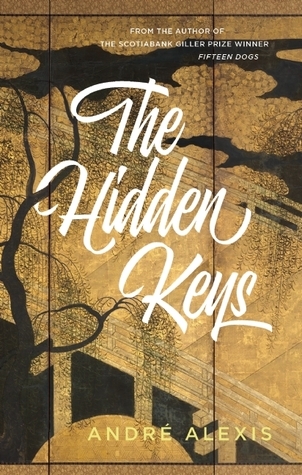 A review of The Hiddden Keys at The Star in which the reviewer reminds us that The Hidden Keys is the third book in a quincunx, a series of five interrelated novels. This sounds intriguing and I’m delighted to say it’s going to be published in the UK! I found the idea of Fifteen Dogs interesting, but not appealing, if that makes sense; this one is both. Thanks Naomi! That makes sense! Maybe you’d like this one better! Hmm, I thought Pastoral was an interesting but peculiar book, and I’ve been wondering if I wanted to read any more by Alexis. I’m not opposed to the idea, but he didn’t draw me in like I thought he might. If it helps, Pastoral was probably my least favourite of the three (although, I think I liked it better than you did). I think this is the most appealing book to me out of the three Alexis books you have reviewed. I imagine it is not easy to be the detective on a case in which your friend is the thief. You know that’s trouble! It really is a lot of fun, and different from my usual fare. I think you’d like it! He really is a treasure – I’m already curious about his next one! Enjoy! I love how you clearly set out what you liked, and didn’t like. I’ve added The Hidden Keys to my TBR list. Wow that’s nice that you’ve read 3 of his books. I still want to read 15 dogs. Alexis is coming here to speak at the book festival in Oct. so I’m looking forward to hearing him. Last year he was an excellent speaker & reader of his work here. A cool guy. Should one read Fifteen Dogs first? I still haven’t had a chance to get to this one (booo! ), but I’m so glad to see you enjoyed it AND that it’s a little different from his other books without losing with makes them so great. I’d say this one is the most fun, so far. Looking forward to your thoughts on it! Majnoun’s people come to dinner? That’s something to look forwad to. I’ve just read the first two pages of this one, so I’m keen to see what unfolds. Glad to hear there’s a lot to enjoy here. Oh, good. Then we can talk about the end! Let me know when you’re done! Oh! Why! What happens at the end? You can tell me, I do not mind spoilers. My library has this author’s last two books, but I obviously cannot read the one about the dogs dying. I think I will hold out for this one, as it sounds more up my alley anyway. I love treasure hunting! And heisting! This one is so hard for me to read, but I’m close to the end, I’m determined to finish the book. I’m not surprised to hear that the ending wasn’t satisfying. I feel like the whole mystery is building up to a whole lot of nothing. I just saw your Tweet. Who knows, maybe you’ll be the opposite of me and think the ending is wonderful after a mediocre beginning and middle! I think this is silly, but the covers of this author’s books really put me off. I’ve seen them getting reviews, the premises seem reasonably interesting, but I just can’t make myself get excited about them!